Scrambled eggs are usually viewed as a breakfast food, but can be served as either the main course or a quick and easy side dish with just about any meal. 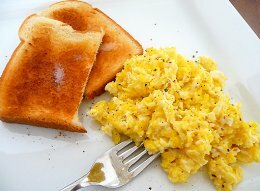 Once you have gathered together your utensils and ingredients, you can get started making your scrambled eggs. First of all, heat up your butter or margarine in the skillet over medium heat. While your butter is heating, break your eggs into your bowl and add one tablespoon of milk per egg. Wisk the egg and milk mixture vigorously until bubbles form, usually 30 – 60 seconds. By that time, the butter in your skillet should be starting to sizzle, so swirl it around in the pan to evenly coat the bottom. Now pour in your egg mixture and immediately begin to slowly stir it around with the spatula. After about one to one and a half minutes, your egg mixture should start to solidify into small chunks in the pan and in another minute or two there should be no liquid left. At this point, the scrambled eggs are cooked and essentially ready to serve. However, some people like to leave them a little longer. When the eggs are done to your liking, scoop them onto a plate and use salt and pepper to taste. If you want to get a little more creative, you can kick-up your scrambled eggs by garnishing them with either fresh or dried parsley, add some tomato slices or sprinkle parmesan cheese on top for extra flavor. Scrambled eggs with a small tossed salad on the side makes for a great, nutritious light lunch! Of course, there are variations you can use to make any dish and the beauty of making scrambled eggs is that it’s pretty hard to screw them up. Below is a video of one person’s method.